After one dog brought to Johnson County from Egypt tested positive for rabies and was euthanized, an animal shelter is taking precautions and placing the rest of the dogs from the group under quarantine. JOHNSON COUNTY, Kan. — After one dog brought to Johnson County from Egypt tested positive for rabies and was euthanized, an animal shelter is taking precautions and placing the rest of the dogs from the group under quarantine. On Wednesday, the Kansas Department of Health and Environment said that one of 26 dogs imported last month from Egypt to the Unleashed Pet Rescue in Mission, Kansas, had tested positive for rabies, a fatal viral disease in people and animals. The remaining 25 dogs had already been placed into foster care or adopted. For those families, the situation has been difficult. "It was hard for me to take her back simply because I don't want to put her back in a stressful environment again," said Caitlin Knoll, who adopted one of the dogs. For the last two weeks, Cairo, a 3-year-old mutt, has lived with Knoll. On Wednesday, Knoll received a call from Unleashed Pet Rescue that she would have to bring back Cairo after the other dog, Kim, was euthanized after becoming infected with rabies. "We didn't expect this to happen," said Jacob Meyer, marketing manager at Unleashed Pet Rescue. "None of the dogs had any sort of symptoms. They were both tested multiple times and vaccinated when they were in Egypt." In a news release, the Department of Health said that all the dogs in the group had health certificates and documentation of receiving the rabies vaccine in Egypt. One dog from the group went missing after escaping from its foster family in Leawood, but officials said Friday that the animal had been found. The dog will be quarantined with the rest of the group at the shelter. Unleashed Pet Rescue said that dog and the others in the group were not showing signs of rabies, but said there were symptoms to watch for in dogs. The 25 dogs, including Cairo, will remain quarantined at the shelter for at least three weeks. “(B)asically we're testing that the vaccinations are in their blood system and essentially just watching them for symptoms to make sure none of them else break," Meyer said. Knoll said she’s glad for the steps the shelter is taking. According to the Centers for Disease Control and Prevention, rabies from imported dogs is rare. There have been four cases reported since 2007. 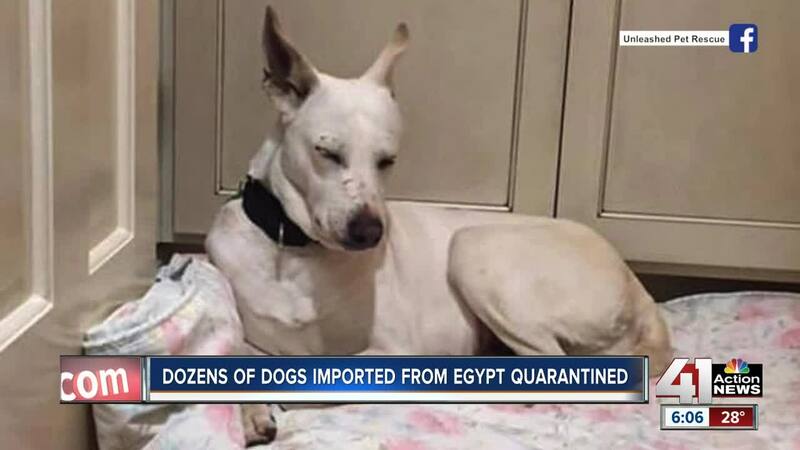 The last two were connected with a shipment of dogs from Cairo, Egypt in 2015 and again in 2017. In 2007, the United States successfully eliminated the canine rabies virus variant. However, globally, dogs remain the No. 1 source of human rabies infections.